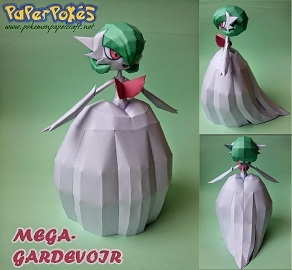 Gardevoir is a humanoid sylph-like, Pokémon. It stands over five feet tall. The classical tutu-type skirt seen with Kirlia is now a long, flowing white gown that completely covers its legs, giving the appearance that it is floating. Gardevoir have long, slender, white legs underneath their gown. The inside of its gown is green in color. The red horns that were once on Kirlia’s and Ralts’ head have moved down onto Gardevoir’s chest and back. Most of its face is obscured by its green ‘hair’, with only some white and its large red eyes visible. It also has long, slender arms that are green like its hair. This entry was posted in Pokemon on 12/06/2015 by ToyXD.